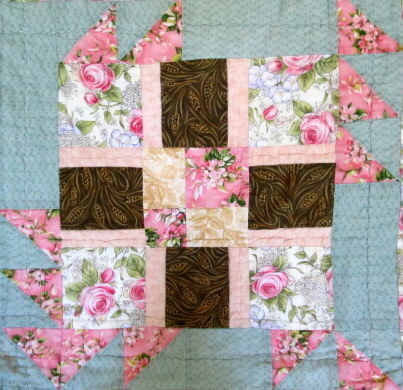 A perfect size lap quilt made with squares and triangles. 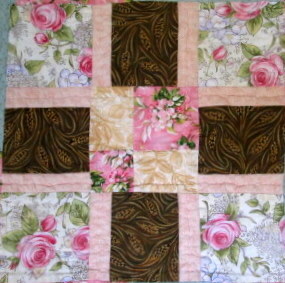 Pictured the patterns is in soft pinks and beiges. This is my travel quilt and it was as many travel miles on it as I do. Hope you enjoy. My name is Beth Strub, I am the author and publisher of The Quilt Ladies Book Collection and Little Quilt Ladies EBook Patterns. 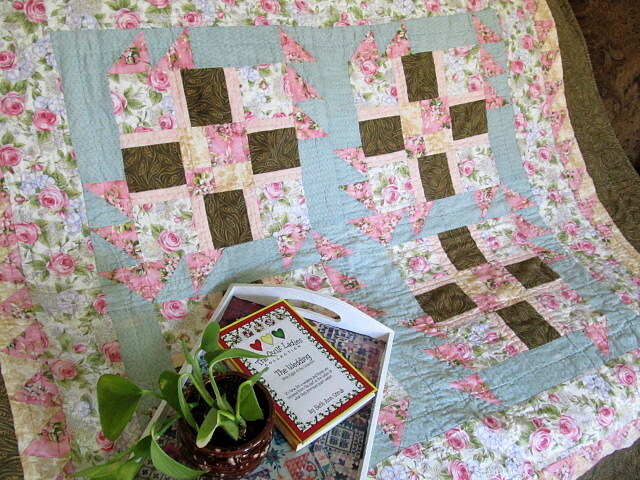 The Quilt Ladies have been sold for just over 15 years, (I started with the first three books) at craft sales and then added my store. Just over 2 years ago, after becoming very sick, I stopped working at a bank and jumped into making The Quilt Ladies a full time dream. 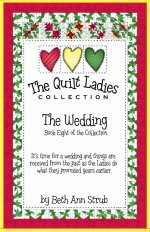 In The Quilt Ladies Book Collection five very different women come together. The books take you through learning to quilt, starting a business, moving, daily life and death. Each book continues the story and has complete quilt instructions for the quilt the ladies are making in that book. Twelve Books in the series to date. The Quilt Ladies are available in both printed and Ebooks. I’ve added Little Quilt Ladies Ebook Patterns, no story, new quilt blocks and patterns, with all instructions. I found auctions and loved the quilts. But, couldn’t afford them, so off to the library checked out a book and here I’m today, 25 years later. Like children you are never to have a favorite, but Book 8 of The Quilt Ladies Book Collection is my favorite book and quilt. I planned a wedding without anyone else’s opinions, ideas and writing it, I didn’t have a budget. The quilt is over the top wonderful. Mine is like the book, red, white and green, with pieced blocks and appliqué. What do you enjoy doing when you aren't quilting? I love cooking, reading and those Grand’s. And, I love to decorate and make something from nothing. Goodwill is my shopping mecca. Long ago we would go to a Great-Aunt’s home in Minnesota, I remember getting to pick the quilt I wanted to sleep under. She would let us change the quilt every night, and before bed, no matter how hot it was out, you had hot chocolate and cinnamon toast, perfect ! Husband and I have been married of just over 33 years, met on a blind date and married. We have the honor of 2 wonderful sons, 2 daughter-n-laws and they gave us 4 Grand’s. I have to say those Grand’s are just about perfect. And, they love their quilts and I have already received a new quilt order for Christmas this year from an 8 year old boy.